Contact Me for this Tour. Visit Tour of TAJ MAHAL guided by me. A white marble tomb built in 1631 - 48 in Agra, seat of the Mughal Empire, by Shah Jehan for his wife, Arjuman Banu Begum, the monument sums up many of the formal themes that have played through Islamic architecture. Its refined elegance is a conspicuous contrast both to the Hindu architecture of pre-Islamic India, with its thick walls, cor belled arches and heavy lintels, and to the Indo-Islamic styles, in which Hindu elements are combined with an eclecticassortment of motifs from Persian and Turkish sources. Later visit world heritage monument by UNESCO, Agra fort built by third Mughal emperor Akber known as a 'Akber the Great'. The first Mughal ruler who did marriage to Rajpoot princess Jhoda Bai. here you can see beautiful palaces, arches, walls, court and gardens. NOTE: THIS IS A WALKING TOUR WITHOUT TRANSPORTATION. On arrival to Agra city, Welcome by Tour Guide. First visit to one of the wonder of the world 'TAJ MAHAL' also known as a symbol of love, built by fifth Mughal emperor Shahjahan in the memory of his beloved queen Mumtaj Mahal. It took 22 years to built by 20 thousand workers. 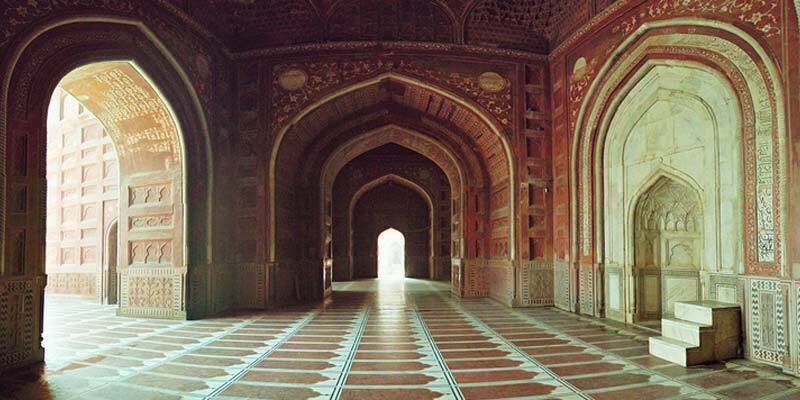 Here you can explore Indo-Islamic architect. Visit marble inlaid demonstration, Art of Taj Mahal by the same descendants who built the Taj Mahal. Lunch break in a restaurant or hotel. later visit Agra fort built by the third Mughal Emperor Akber also known as a 'Akber the Great'. The first Mughal ruler who did marriage with Hindu 'Rajpoot' princess Jhoda Bai. Here you can explore Indo-Islamic architect with Emperor Akber's style of architect, beautiful palaces, arches, walls, court and gardens, etc. After that back to hotel or onward journey. * Meet up location: Hotel lobby or any palace where you want to meet. * End location: anywhere where you want to leave in city. * Tour Guide Services. (Explanation of monuments). * Entrances tickets of all monuments.